At Monty Products Australia, we only stock the very best equipment. That is why we are proud to be suppliers of Pneuvibe, a product that increases the efficiency and safety of your job. 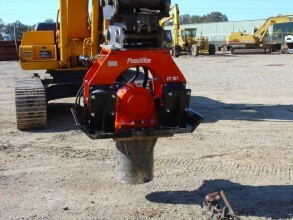 Pneuvibe compactors use a boom mounted plate that is used for inclined compaction. It can be used in a number of applications and will complete the job more efficiently and safer than other machines. The Penuvibe plate compactor is an easy-to-use attachment that can be fitted to any machine’s hydraulics, whether it is a backhoe or excavator. The Pneuvibe is the ultimate tool in soil compaction – able to work with most soil types. By packing the soil to a particular level of density, it makes it more efficient to drive sheets or piles into the ground, making your project so much easier. If you’re after a vibrating compactor for sale, contact us to see how the Pneuvibe can assist you with your next job.